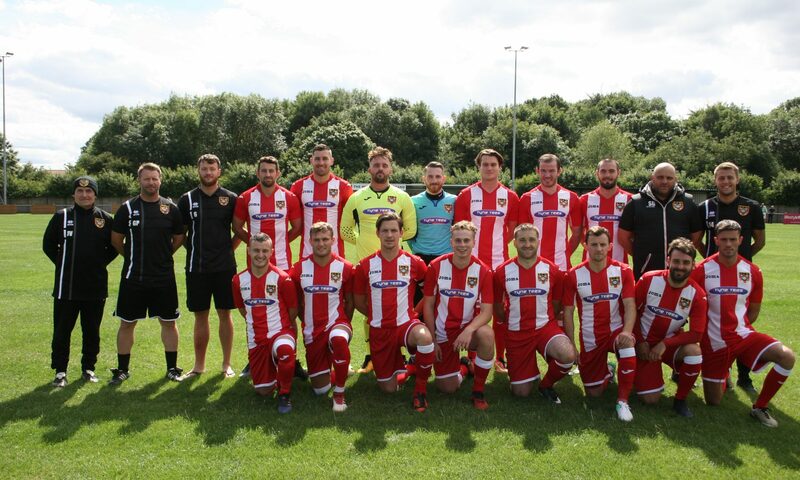 Ryhope CW slipped to a narrow 1-0 defeat to North Shields in their Northern League Division One encounter. Ryan Carr gave North Shields a first-half lead and Ryhope failed to respond despite piling on the pressure in the second half. Colliery Welfare headed into the game on the back of two consecutive league victories, including a first competitive Ryhope Derby victory. They made a couple of changes to the squad that beat RCA, new signing Gary Shaw coming straight in at left-back, while Ben Riding returned to the XI following his suspension. North Shields piled on the pressure early on, putting plenty of balls into the box. Ryan Carr had a good chance from one of these in the 18th minute, but his header was far from the target. Stuart Donnison fizzed a good ball into the box minutes later, but nobody got on the end of it. Ryhope failed to get hold of the ball in the first-half, but did manage to create a couple of chances. In the 29th minute, James Ellis made a good run on the left and got a good cross in which Craig Ellison narrowly failed to get on the end of. North Shields got the breakthrough in the 33rd minute. A corner came in, which was headed down for Ryan Carr to smash home from around 10 yards out. Most of the game was with North Shields, but Robbie Bird and Matty Weirs both had half-chances before the break. The game turned in Ryhope’s favour after the break, with the wind and sun against North Shields. Ryhope’s first good chance of the second-half came in the 49th minute. Ellis with a good delivery from a corner, Riding and Ellison failing to connect properly with it. Ellison had another good chance in the 52nd minute. An attempted North Shields clearance was shanked in his direction, he was able to run one-on-one with Greg Purvis but his shot was straight at him. North Shields did have chances of their own in the second-half. A cross fell nicely to Adam Forster in the box in the 57th minute following a half clearance, his right-footed half-volley going wide of the left post. A good passing move from Ryhope in the 68th minute gave Ellis plenty of space outside the box, however his shot was always rising. Matty Weirs did well to get a shot on in the 78th minute, Shaun Pickford teeing it up for him to turn and hit on the half-volley just wide of the right post. Matty Cornish could have put the game beyond doubt in the 82nd minute, he got the ball just inside the box before shifting onto his right but missing wide of the left post. There were a couple more half chances for both teams towards the end, but neither side found the goal. “The game was very frustrating today,” said Colliery Welfare boss Gary Pearson. “We had a bit of a selection headache, when you win a game it backs your selections up but today it didn’t back us up. “I think the performance was decent. But I think it massively broke down in the final third with the decision-making. “We worked hard today, we huffed and puffed and defended extremely well. We missed a few opportunities, admittedly they had a few more opportunities against us. On what was going wrong in the final third, Pearson added: “There was Ellison’s header in the first-half, he should have put that away. He knows he should have and he’s really frustrated. “Craig was a breath of fresh air when he started for us midweek against RCA, his willingness and workrate was fantastic and he got a great goal. “He did take a knock in that game. I don’t think he was 100% today. “It wasn’t just him. You had Ben Riding’s header. You had two balls that were flashed across the box from Cozza that nobody got on the end of. We never saw Ziggy in the box. We never saw Matty Weirs or Robbie Bird get anything off. “I think that was down to North Shield’s very solid defensive display. Ryhope had a very strong penalty shout when Corey Nicholson looked to be getting pushed on the right side of the box, on this Pearson said: “Cozza is as strong as a bull. “To me, I must be honest, I’m not normally critical of referee and linesman as it doesn’t change anything. But I really think the referee could have given something there. “To my knowledge you can go shoulder-to-shoulder, but you must be in playing distance of the ball. The lad was nowhere near the ball, and it was more than just a shoulder-to-shoulder, it was more of a big push. At this point of the interview Gary Ormston of North Shields gets involved, admitting that he thought Jordan Summerly dived and that Corey Nicholson should have had a penalty. On individual performances Pearson said: “Ben Riding came back in. “He’s the captain and we put him in there as we know we get a wholehearted display from Ben. It was a question of whether we bring him back in as Tom Bott has done well, but you’ve got to back your captain and I thought he was brilliant today. “I thought Danni Lay beside him was absolutely amazing. He was head and shoulders above everybody in the side, showing his great willingness and determination, I thought he was excellent today. The defeat comes off the back of a good week, and Pearson believes it will do nothing to hurt the confidence the squad have picked up, saying: “No we’ve instilled that. “The squad’s big and strong now. We’re not looking to bring in anyone at present, I’ve done all my work the last couple of days, bringing in Gary Shaw from Hebburn. “We’ve signed Jack Walker and we’ve got Leon Ryan on cover. So we have nothing to bring in. “It’s nice to have a really big squad to pick from. I have had a word with a couple of players, you’ve got Nat Skidmore who hasn’t played for a couple of games. “I’ve told Nat he needed a couple of games out and have a bit of a rest before coming back in. “You’re looking at Consett, they play on a 4G pitch. You need every footballer you’ve got on the pitch because it’s a totally different game on that. “It breeds football and if you’ve got players on the pitch that aren’t used to playing that type of football, I think they start trying to do things they wouldn’t normally do.